I am an Associate Professor in the Department of Astronomy at Cornell University. I am interested in the dynamics, geophysics, and geodesy of solid planets. Current projects include the study of binary minor planets in the near-Earth, main belt, and trans-Neptunian populations; high-precision measurements of planetary rotation; asteroid dynamics; and planetary instrument design and development. MESSENGER spacecraft executes Mercury flyby sequences flawlessly (2008 Jan 14 and Oct 6). Instruments aboard MESSENGER returned spectacular new data of Mercury. My role on the Science Team is to combine spacecraft and ground-based data (gravity, topography, dynamics) to characterize the interior of the planet. 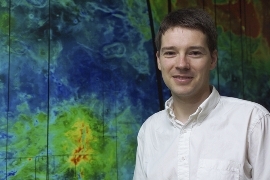 Cornell graduate student Patrick Taylor discovers asteroid satellite (2006 Jun 02). Read the discovery announcement here. Does the official definition make sense? Two new instruments installed at the Arecibo Observatory. Download a copy of the 2004 Urey Prize Lecture: Binary Minor Planets given at the 36th meeting of the American Astronomical Society's Division for Planetary Sciences.